Sunflower seeds are a healthy snack, a salad garnish, and a baseball dugout icon. But how much do you know about the state’s hybrid seed production that results in the global planting and growing of oil and confectionary-type sunflower seeds? 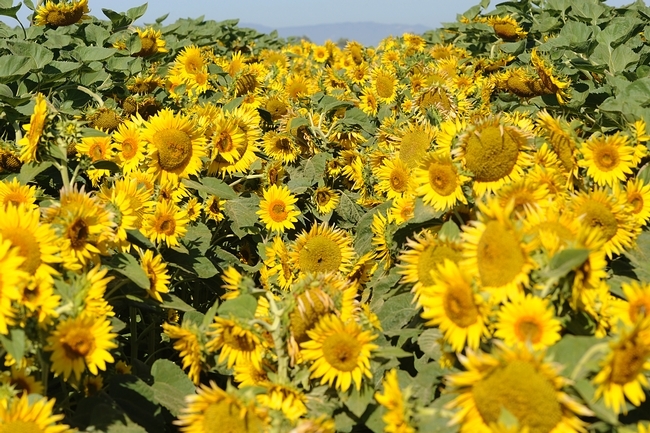 Do you know that the Sacramento Valley produces about 25 percent of the world’s hybrid planting sunflower seeds? We grow some 47,000 acres of this crop, valued at about $70 million (2012 County Crop Reports). Even better news is that the hybrid sunflower seed production industry is growing, sparked by the demand for our high quality seed and the increased interest in sunflower oil worldwide. In 2007, for example, the value of California’s sunflower seed crop totaled $22 million on 27,000 acres. Fast forward to today and we see a 70 percent increase in acreage and more than a three-fold increase in value. Additionally, the industry reports millions of dollars in seed sales to markets around the world including the Midwestern states as well as the four largest producers of sunflower oil: Ukraine, Russia, European Union, and Argentina. The sunflower (Helianthus annuus) is native to North America; the Native American Indians prized it as an important, high-energy food source. Indeed, sunflower oil is a healthy choice; it is light in taste, supplies more vitamin E than any other vegetable oil, and delivers low levels of saturated fat. Sunflower oil is also stable at high cooking temperatures, rendering it favorable to the food processing industry. Production of hybrid sunflower seeds involves planting male and female (male sterile) lines in the same fields, usually alternating with six rows of females and two rows of males. Males generally possess multiple flowers on a stock, compared to the single composite female flower. Honey bees, usually two colonies per acre, move the pollen from the male to female lines. 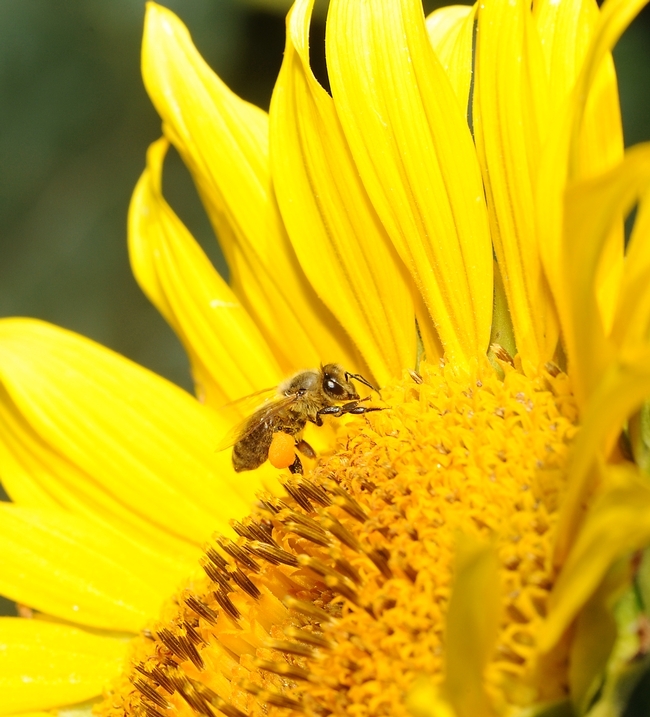 Native solitary bees (especially sunflower bees) are also important in sunflower seed production, not only because of their pollination but because their presence increases honey bee activity, causing greater dispersement between male and female lines. After pollination, when the seeds are set, growers remove the male rows to prevent contamination with female rows. After the sunflower stocks naturally dry down, the hybrid planting seed is harvested with yields averaging 1,400 pounds per acre and 40-45 percent percent oil content, depending on the variety. Compared to open pollinated varieties, hybrid planting seed from controlled crosses of male and female lines result in higher yields and oil content. 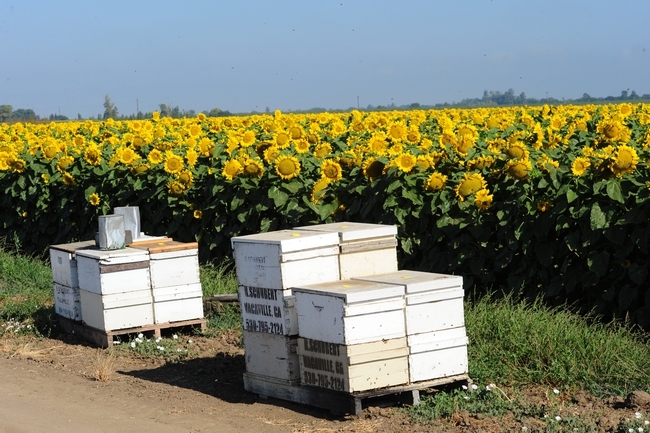 The plants also display better disease resistance, a high degree of self-compatibility (reducing the need for bee cross-pollination), and more uniformity in height and moisture content at maturity, which facilitates harvest. It’s crucial to maintain field isolation between different hybrid sunflower varieties so that the seed produced remains pure to the desired cross. As a result, growers plant different sunflower seed varieties at least 1-1/4 miles apart or they separate fields in time so that they bloom at different times in the season, thus preventing pollen drift. volunteer sunflowers from the previous year, wild sunflowers, and sunflower varieties blooming in backyard gardens pose risks to hybrid sunflower seed production. Roguing prior to bloom is important when nearby production fields are blooming. 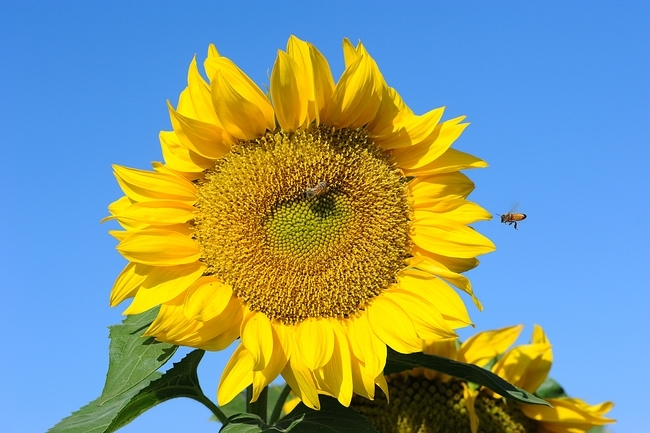 Do you know that sunflower seed production has few pest or disease problems? Sunflower head moth, a native caterpillar pest, can attack the seed heads as well as occasional flocks of birds (starlings, blackbirds, and finches) triggering yield and quality losses. 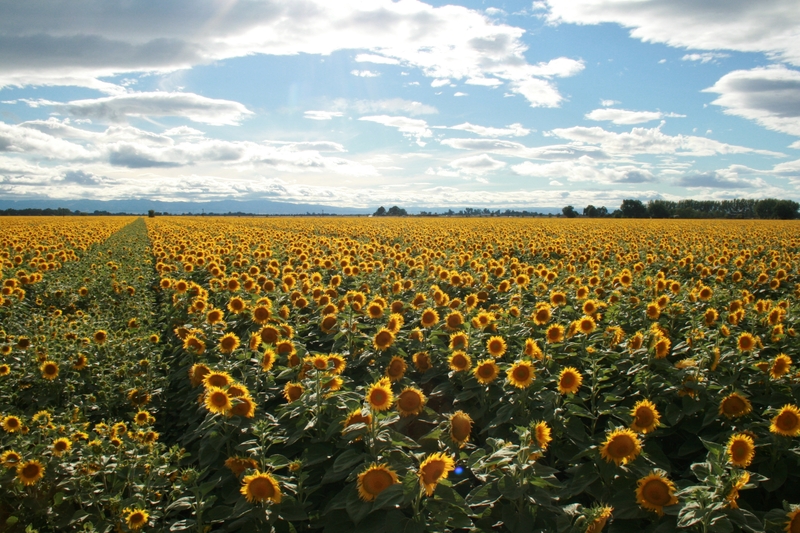 As the result of industry and research efforts, along with our near perfect weather for seed production with hot, dry summers and cool nights, the Sacramento Valley is known throughout the world as a premier location for sunflower breeding, variety development, and seed production. In the summertime, the brilliant golden colors turn fields in the Sacramento Valley into Vincent Van Gogh-like paintings. Sunflowers are also fun to watch because in the bud stage they track the movement of the sun across the horizon. Once the flower opens it faces east toward the morning sun, which may help prevent the sun-scalding of seeds. So, whether you like to cook with sunflower oil, snack on sunflower seeds, use them as a salad garnish, or watch your favorite baseball players crack them between innings, sunflowers pack a major economic agricultural wallop that begins right here in the Sacramento Valley. Who knew? Now you do. What a great blog on sunflowers. Other then the males having more then one head, is there another way to tell males from female plants? Where are these fields/farms located in the Sacramento Valley? Hello, I would like to ask you if you please can tell me where can I find these type of flowers because I would like to visit them and take pictures. I live in Fresno and I am not sure if you have some available in this area or only in the Sacramento county. I appreciate your help and time, too. Yolo County, near UC Davis; mid June to mid July is a good time to see the sunflower bloom. send us specification your best highest eyelid variety free sample through courier for trail purpose ? what is your best Price CNF at karachi port ? Sunflower varieties are proprietary and you would have to contact the different companies for seed. Can you contact me, please. My wife last week was diagnosed with Follicular B-Cell Lymphoma. One of the alternative method to fight with cancer is to use certain quality of sunflower oil. - more than 0.2% Phosfates. We live in California, USA. Do you know manufacturer of Sunflower oil with quality we are looking for? Also, there is a cost of production study on the North Dakota State University for production of commercial sunflower.